Since its inception, the Orion String Quartet has been consistently praised for the extraordinary musical integrity it brings to performances, offering diverse programs with classic works of masterworks by 20th and 21st century composers. The world famous Orion String Quartet is now celebrating its 30th anniversary of playing together and embarking on an anniversary tour. On this this tour, the Orion String Quartet are joined by the remarkable flutist Tara Helen O’Connor which only adds to their quality of performance. Charleston audiences know Tara Helen O’Connor and Daniel Phillips from the Orion String Quartet through their annual performances with the chamber music series at the Piccolo Spoleto Festival. Each year the festival’s audiences look forward to the variety and beauty of their playing. 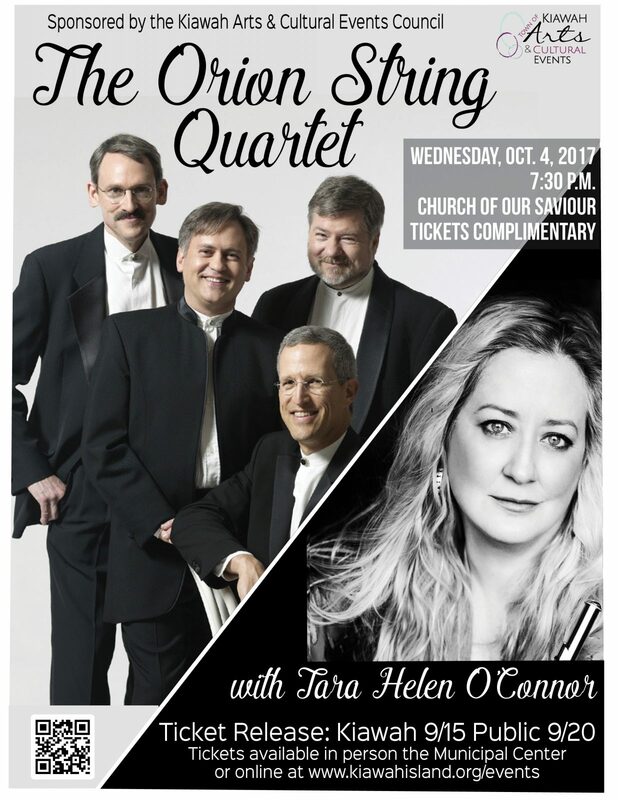 Both Tara Helen O’Connor and the Orion String Quartet are seasoned artists of the Chamber Music Society of Lincoln Center and perform at the Santa Fe Music Festival, Music at Menlo and other noted musical festivals. The Orion String Quartet is composed of Daniel Phillips and Todd Phillips (brothers who share the first violin chair equally), violist Steven Tenenbom and cellist Timothy Eddy. They are praised for the extraordinary musical integrity and artistry that they bring to their performances. Known as a charismatic performer with great artistic depth, brilliant technique and colorful tone, Tara Helen O’Connor is a two-time Grammy nominee and the recipient of an Avery Fisher Career Grant. By the way, Daniel Phillips and Tara Helen O’Connor have been married for over nineteen years. Sponsored by the Town of Kiawah Arts and Cultural Events Council, complimentary tickets are available beginning 9/15 for Kiawah residents and 9/20 for the public. Get your tickets online at www.www.kiawahisland.org/events or in person at Kiawah Island Municipal Center 843-768-9166.